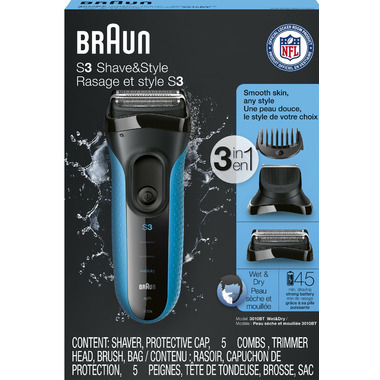 The Braun Series 3 Shave & Style is a 3-in-1 Wet & Dry Shaver with Precision Trimmer & 5 Comb Attachments. This styling tool features simple to change heads for easy sideburn and mustache shaping. Triple Action Cutting System: Twin foils and an integrated middle trimmer shave progressively closer. Together they effectively cuts both long and short hairs with every stroke, adjusting to facial contours with every stroke. The difference to other shavers is noticeable, especially on 3-day beards. Shave wet or dry: You can use this shaver with water, foam or gel for even better gliding and a smoother skin feeling. Plus you can even shave in the shower. Great handling: The ergonomic grip with iconic Braun rubber dot pattern provides secure handling, even in wet bathroom conditions or when you rinse your shaver under running water. 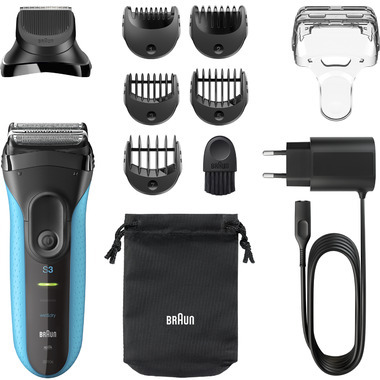 Braun’s lifetime-lasting sharp blades are engineered to the highest standards. LED display : For low charge or battery status.